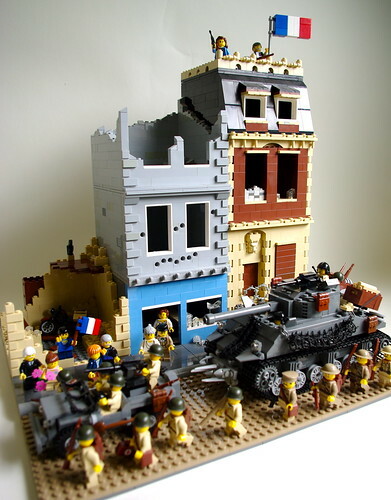 Brick Town Talk: The Liberation of Cherbourg - LEGO Town, Architecture, Building Tips, Inspiration Ideas, and more! The Liberation of Cherbourg (1), originally uploaded by Dunechaser. Dunechaser unveils a a classic scene from World War 2 with his Cherbourg diorama. Excellent photography and extremely realistic buildings make for an inspiring creation. My favorite aspect is probably the jagged gray wall in the back, very well done. We look forward to more Dunechaser!